Onlinestrength analyzed 10 best-selling BCAA supplements in the United States. Over the course of seven weeks, we reviewed 147 unique references to scientific papers on BCAA supplementation, compared dozens of BCAA formulations, sifted through thousands of customer reviews, and consulted leading fitness experts. Based on the knowledge we gathered during our 7 week BCAA supplement review, we chose to rank products based on their purity, quality, ingredient formulas, and overall effectiveness. Products received negative rankings in the Ingredient and Quality sections for the presence of presence of key watchlist ingredients, including artificial sweeteners, coloring agents, and preservatives. The branched-chain amino acids or BCAA supplements encourage muscle repair and exponentially increase muscle growth over time. Not only that, Bcaas delay and prevent fatigue, support muscular strength, increase reaction time and can even boost fat-loss. 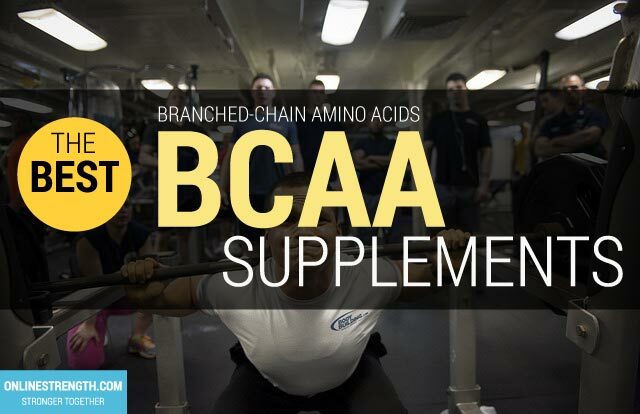 The three amino acids Leucine, Isoleucine, and Valine come together to form Branched Chain Amino Acids (BCAAs) and all three play a vital role in beneficially influencing the muscles. Athletes or individuals who exercise take BCAA supplements to help improve their strength-training and endurance results. Regular supplementation may help you recover faster in between workout sets allowing you workout more effectively which may lead to faster strength and lean muscle gains. Studies show that branched-chain amino acids may help improve focus and mental clarity during training. More focus plus faster recovery may help you take your training to new levels as distractions and fatigue are key areas most gym-goers suffer in. Studies also show that BCAA supplementation may improve performance under extreme conditions such as high altitudes or intense training. Building lean muscle mass is often the main reason for working out. Males and females too, are looking to trade in their fat for some lean, good looking muscle. In contrast, male/female athletes want to avoid losing muscle mass. Because of this, it is proven that supplementing branch chain amino acids will prevent muscle breakdown, especially valuable in a fasted state. Not only that but BCAAs will promote muscle protein synthesis; muscle repair and muscle recovery – And in the long term increase lean muscle growth. This will help maximize your ability to build muscle more effectively than ever before. This one is entirely easy to understand and can be backed up by science. A bigger muscle is a stronger muscle, right? One of the first things you’ll notice from the result of bigger, leaner muscles is that you also have more muscular strength. With an increase in muscle protein synthesis your body will be able to repair damage muscle tissue faster and more effectively. This will allow you to workout longer, more often, and eventually with heavier weight. This cycle is a continual positive process, everything working synergistically to help you operate at your absolute maximum day in, and day out. Not only are you getting optimal muscle repair and growth, BCAAs also prolong endurance exercise. Several studies have been shown that your muscles will be able to workout and endure more strenuous workout loads. An increased time to exhaustion will allow you to workout longer which in return will help you build more muscle faster than those who aren’t supplementing BCAAs. Not only are you going to have better muscle endurance, but mental fatigue will no longer be an issue. Studies have shown athletes have less mental fatigue and better reaction time after workouts when supplementing BCAAs. So by now you probably know that bcaas are a great muscle builder, but on top of that they can also aid in fat-loss. Having less body fat will not only make you healthier, but you’ll look 10x better with lower body fat. Studies have shown that your body will have an increased fat oxidation abilities. Throw in this increased fat burning potential along with more endurance, less fatigue, and increase lean muscle growth, gives that body fat a zero percent chance of sticking around for too much longer. Leucine has also been found to reduce hunger, those who are dieting will benefit greatly from a decrease in hunger pains. For optimal results you want to stick to a bcaa supplement that has a 2:1:1 ratio of leucine : isoleucine : valine. This ratio will give you the maximum benefits. Pre-Workout – Mixing up a serving and drinking it down 30 minutes before a workout will maximize energy levels and blunt fatigue during the workout. Very important if you’re training in a fasted state. During – Its fairly common to drink your bcaas through-out your entire workout to help reduce fatigue, increase recovery and kick-start the recovery process. Faster, stronger, better workouts. In between meals to prevent hunger pains and keep your muscles fueled with nutrients. Post-workout – Drink your bcaa’s straight after a workout. This will supply nutrients to muscles needed for repair, recovery, and growth.